My Goodies Box has arrived! 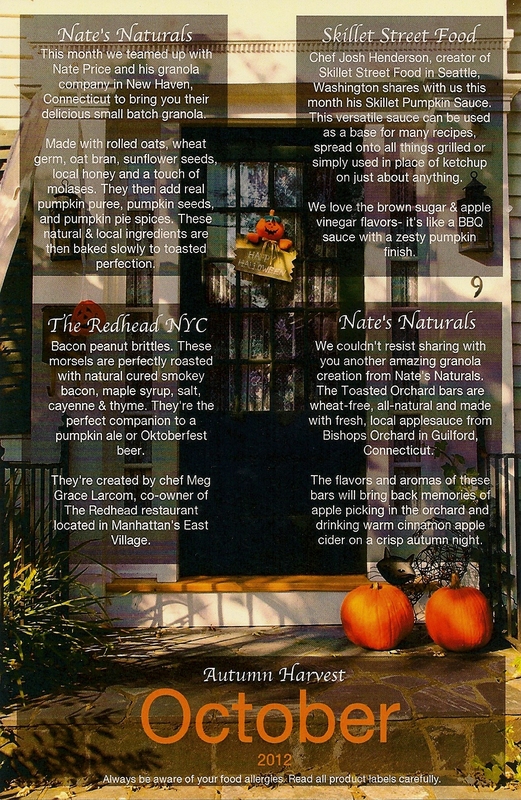 Posted: October 26, 2012 in Goodies Co. I was really surprised when the mail carrier knocked on the door … I wasn’t expecting anything. I had just received my notification that my box had shipped a day or two ago, so I wasn’t expecting my Goodies box until a little closer to the end of the month. But this was a happy surprise, and especially welcome given the evening that I had last night, and the day that I’ve been having today. Last week, my husband had come down with a bad cold (maybe it was the flu?) and he had to miss a couple of days of work. Anyone who knows my hubby knows that he just doesn’t miss work. He has to be really sick to miss it. Otherwise, he drags himself in there. That’s just the kind of guy he is. So when he needs to call in sick … you know he’s sick. Fortunately, it wasn’t a long-lasting bug … he was feeling down and out for a couple of days, but he was able to head back to work after only missing a couple of days. And after a few more days had come and gone, I thought that maybe I was in the clear and I wasn’t going to come down with whatever he caught. Yeah… no. It didn’t happen that way. At some point late at night I started feeling really sick … hot one minute, freezing the next, and every time I’d swallow it felt like I was swallowing razor blades. Achy everywhere. In short … not feeling good. This just hasn’t been my month! First a sprained ankle, now some flu or cold bug. I guess we can’t be 100% … 100% of the time. So, it was a nice surprise to have my box arrive today … even though I don’t have the taste buds to really enjoy anything (I’ll be saving these goodies until after I’m feeling better), it was nice to get a lovely box of goodies! The “theme” card of this box reads “Trick or Treat” which suggests that there are all kind of indulgent goodies in the box. (I guess the fact that it’s called a “Goodies Box” might also lead one to assume that the box is filled with goodies too! ), and really, that’s what’s in here. Most of these goodies are ones I haven’t yet tried! I like that, because I love trying something new. Who knows … I might just find a new favorite! 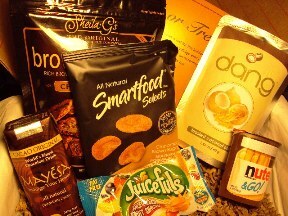 Tucked inside this month’s box are Toasted Coconut Chips from Dang, a Mayesa drink box (it appears to be a chocolate-y drink), Cinnamon Brown Sugar Smartfood Selects, Juicefuls, Nutella & Go, and a bag of Chocolate Chip Brownie Brittle. YUM! Again, a box brimming full of yummy goodies for just $7. I am not sure how Goodies Co. does it! I’ve tried Nutella before, and I do enjoy it, although I must tell you that I’ve discovered a better product (Justin’s Chocolate Hazelnut Butter) so I guess this is probably the only product I’m not super-excited about. But I’ll still enjoy it! As I said before, I’m not going to start digging in to this box until I’m feeling better, I can’t really write a review on these foods with my tongue feeling as though it’s covered in a blanket and only about 1/4 of the flavor getting through. I want to have my taste buds in full working order to taste these! These fruit + nut presses from Grace & I are elegant, delicious, and utterly unique. They are gorgeous (pictures do not do justice) and add a gourmet statement to any cheese board or fruit tray. Wow dinner party guests or surprise the foodie in your life who’s seen/eaten everything. They even come with their own wooden board for extra charm. Sweetest of the presses, the fig + nut, is one of their best sellers. This product is available on Petit Amuse. This fruity, nutty snack is something that seems like it would go very nicely with wine, so I selected a tea that is wine-infused to enjoy with this it. This Wild Monkey Marsala seemed like the perfect fit: the cinnamon notes of the tea really enhanced both the fruit and nut flavors, and while this tea doesn’t offer a strong “wine-y” taste, the dimension of flavor in the tea really seems to accent the Fruit & Nut Press very well. This Fruit & Nut Press from Grace & I was part of this month’s Petit Amuse sampler box, and at first glance, I thought that this was a fruitcake of some sort. But it isn’t! Instead, it is dried figs, hazelnuts & almonds that have been pressed together into a square, cake-like form, looking very much like a dense fruitcake that’s loaded with fruit and nuts! But there’s no cake in this, no pastry, just fruit and nuts! Just the very best part of a fruitcake, all compressed into a square (for the sampler box, we actually received a smaller, rectangular slice of the Fruit & Nut press). I love the delicious fig taste of this Fruit & Nut Press, and I’m also really enjoying the variety of textures within it. The fig is soft yet chewy, and then every once in a while, I reach the solid crunch of a nut. It’s really quite delightful to eat. As I nibble on this delicious snack, I can’t help but think how perfect this would be served on a cheese platter at one of those fancy New Year’s Eve parties that my father and step-mother used to host. It is sweet, nutty, fruity, and tart, with barely there touches of saltiness all in one bite. It would offer such a pleasant contrast to the sharpness of a good cheddar or a Bleu cheese. It would also be great to serve along with finger sandwiches during tea time! Just browsing through the Petit Amuse website, I probably would not have thought of putting something called a “Fruit & Nut Press” in my shopping cart, at least, not until having tried it! But I love that the sampler subscription lets me do just that – try some of the yummy items that are offered at Petit Amuse, all for a very reasonable $10 per month! My October Knoshbox has arrived! This month, my Knoshbox arrived on what turned out to be a very bad day for me. As I was walking down to the mailbox to check the mail, I rolled my ankle and sprained it. Painful! And I mention this because there was no mail in the box – the mail carrier had not yet arrived – and because this box was delivered in a medium flat rate box the mail carrier had to bring it up to the door anyway. My disastrous trip to the mailbox was completely unnecessary. How fate laughs at me. A scan of the theme card in this month’s box. I didn’t get a photo of the box and its contents before I started munching on the Bacon Peanut Brittles. By the time I got home from the hospital, I was on painkillers and had totally forgotten to snap a picture before I began munching! Sorry! But… let that not lead you to think that this month’s box is also disastrous – far from it! This may just be the best Knoshbox ever! It contained only four items, but, one of these items is so beyond exciting! A full-sized container of Pumpkin Sauce from Skillet Street Food! OH yeah! I’ve been wanting to try this since trying their Bacon Jam. Also in this month’s box was a full-size package of granola as well as a Toasted Orchard Bar, both from Nate’s Naturals, and a full-size package of Bacon Peanut Brittles from the Redhead, NYC. I’ve already sampled the Bacon Peanut Brittles, and they are amazing… so perhaps I might share this package with my husband. Maybe. Anyway, this is a very exciting box, and I’m so happy that I have the opportunity to try these products. Also included in the box is the theme card (this month’s theme is “Autumn Harvest”) which told of the inspiration behind the four selections. The only thing that I’m missing this month is the little handwritten note on the back of the card. It’s a small thing, but, I like that special touch. It makes me feel like I am getting a gift from a friend that was packaged with care rather than an assembly line packaged box. Knoshbox, if you’re reading this … I like the handwritten note. It was a nice little touch. As you can see by my little note under the scan of this month’s theme card, I have already started diving in to the yummy goodies in this month’s box! Bridge City Cafe is not our (my husband and my) ordinary kind of lunch stop. Especially the Bridge City Cafe in the Lloyd Center Mall. We generally avoid the mall food court because it seems like they’re usually more expensive than other lunch stops. After all, they do have the high overhead costs for their prime location in the mall, and they’ve got to recoup those expenses. But, because we were going to be in the mall anyway (we had to rent a suit at the Men’s Wearhouse for my husband), and there was a great deal on LivingSocial, we decided to “break the rules” and visit Bridge City Cafe in the Lloyd Center Mall. We enjoyed it so much that when we had to return to the mall the next day, we stopped in again! Order: The Living Social voucher entitled us each to a sandwich of our choice, a bag of chips, a drink and a cookie. On day one, I ordered the Steel Roast Beef sandwich, and on the second day, I ordered the St. John’s Turkey Cranberry sandwich. The atmosphere … well, you know the atmosphere. This Bridge City Cafe location is in the food court in the mall. Kids running around and screaming, babies crying, mothers yelling, cell phones beeping, and generally a lot of hurrying and scurrying around. As an agoraphobic, it isn’t my favorite kind of atmosphere … not at all conducive to a comfortable place to dine out. But, sometimes, when one is hungry and time is short … my daughter was getting married in a matter of days and I didn’t have a lot of time to go out and enjoy myself. So, we picked up lunch where we could and how could we NOT take advantage of the LivingSocial voucher! We each got a whole sandwich of our choice, a bag of chips, a drink and a cookie! The word of this paragraph is FRESH. That’s because everything about the sandwiches is FRESH! The sandwiches are all made fresh to order, the bread is fresh (and soft and amazing!) and all the trimmings were fresh. The lettuce wasn’t wilted, it was crisp and … yes, fresh. Everything looked really appetizing. The one exception was the tomatoes, which were a bit more on the pink side than the red so I picked those off of the sandwich. I usually only want a tomato on my sandwich if it’s really ripe and tender. Truly the best part of these sandwiches IS the bread. I love that I had a sandwich made with bread that was baked in the shop that very morning. The sourdough used to make the Steel Roast Beef was soft but with enough of that sourdough texture to give it some real substance. The St. John’s Turkey Cranberry was made on a honey molasses bread and it was sweet, soft, and delicious, and really complimented the tart cranberry and the mild, juicy turkey very well. We also got our choice of cookie, and I chose the lemon cookie. Let me tell you something, if you’re ever near a Bridge City Cafe and are hungry for a fresh, homemade cookie … stop in and TRY the lemon cookie! It tastes like a lemon bar! You know the kind with the shortbread crust and the lemon curd-like filling? Yes… it tastes just like that… with the shortbread and the lemon curd baked right in. It’s amazing. If you’re a fan of lemon-y baked goods, these cookies ARE NOT to be missed! I really enjoyed both visits to Bridge City Cafe. Sure, I’d rather not eat in the mall – the atmosphere is a bit much for me and tends to make me anxious. But, if I happen to be in the mall and find myself hungry, I know where I want to go. This is definitely one of the best stops at the food court! Unlike most crackers, Castleton crackers are not just vehicles for other foods but are flavorful and hearty enough to be standalone snacks. They come in large cracker sheets that you break, which adds a nice rustic quality but are sophisticated enough to present at a dinner party. With the addition of caraway, sesame and poppy seeds, this rye cracker has not only a strong rye flavor but also pleasant nuttiness. It would be stellar with cream cheese and lox or for snacking on its own. 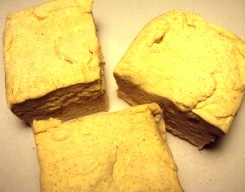 These Castleton Crackers are available from Petit Amuse. With such a hearty texture and tasty rye flavor, I wanted something that would complement the cracker without overwhelming it. I chose this 2012 Margarets Hope 2nd Flush Darjeeling from Darjeeling Tea Lovers. The delicious muscatel notes of the tea seemed to accent the unique complexity of the cracker, while something about the buttery taste of the cracker and the astringency of the tea just seemed to really go together perfectly. Having already tried the Windham Wheat crackers from Castleton, I was pretty confident that I’d probably enjoy these crackers, even though rye crackers are not usually something I tend to reach for when shopping for crackers. I usually prefer wheat (and I like the rice crackers too!). It’s not that I dislike rye, I actually quite like rye bread, I just never really considered rye crackers. But now that they’re sitting in front of me and I’m devouring the small sampler package that was part of my Petit Amuse box for October, I’m asking myself WHY have I never really considered rye crackers? I really am enjoying these. I love the caraway seeds and the flavor they add to the cracker. They are slightly anise-y, adding a hint of licorice-y flavor to the cracker, while the poppy seeds add a nice crunch and the sesame seeds add a nice, nutty flavor to the cracker. These crackers are even better than rye bread, and I daresay that I like these better than the Windham Wheat! They have that same buttery, delicious quality of the Windham Wheat crackers, but, with more texture! I like these crackers a lot. I am considering making these a permanent staple in my pantry. Each yummy square is topped with crunchy almond slices and made with good-for-you ingredients like our seven whole grains, sweet potatoes and beans. And with natural sweetness from agave, 4g of fiber and 300mg of ALA omega-3, they’re a nutritious snack your kids will ask for by name! 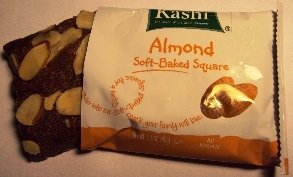 This Kashi Soft-Baked Square was part of my Goodies Tasting Box for September. Because of the cake-y/cookie like taste of the square, I decided that a black tea was the way to go. I went with this Assam Mangalam from Zen Teas. The robust, malty tones of the Assam gave this hearty bar from Kashi a boost, and this snack became a meal! I can’t recall ever having tried Kashi’s products. I kind of see them as “trendy” foods… like they’re pushing this health food angle because it’s the “in” thing to do, but, I always find myself wondering if they’re really nothing more than those other fatty junk foods, just dressed up to appear to be something it’s not. But, after quickly perusing the ingredient list here, I’m pleased at what I see. I don’t see any artificial sounding ingredients … this stuff all looks like healthy options. There are some sweeteners in this: agave, tapioca syrup (this is a sweetener, isn’t it?) and cane juice … and while the verdict is out as far as I’m concerned with agave (is it healthy, or is it just glorified corn syrup?) I’m happy to see that this doesn’t seem to be chocked full of sugars and most of the ingredients appear to be whole grains and other healthy foods. There’s even sweet potatoes and garbanzo beans in this! Wow! But this doesn’t really taste like cardboard or something equally as lackluster. This is really quite tasty! The bar itself has a taste that reminds me of the cake-y part of a Fig Newton, only denser and more delicious and satisfying. The slivered almonds on top added a little bit of texture to the square, as well as a yummy, sweet almond taste. Overall, this is sweet, but not too sweet, and really quite tasty. Something I wouldn’t mind eating more often. This is a very substantial, tasty bar. This is something I could see myself keeping stocked in the pantry, it’s energizing and delicious, something that I could snack on and not feel guilty afterward. And it’s very satisfying – I found those in-between meals hunger completely satiated after nibbling on this one bar.